I was recently featured in a local Tohoku newspaper called the Fukko Kamaishi Shinbun. Below is the Tyler Foundation’s English translation of the article from January 25, 2012. Children smile with magic and games Tyler Foundation’s Shine On! Smile Ambassador visits nusry school in Kamaishi City. Gaetano Totaro – Guy, the Tyler Foundation’s Shine On! Smile Ambassador, provides the opportunity for children to forget their worries through magic and games. 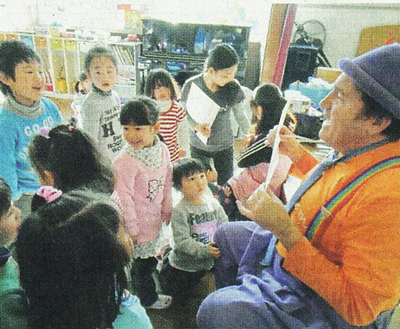 On January 17, he visited 82 children and the principal of a nursery school in Kamaishi in Koshi-cho. Having visited several times already, he is quite a popular guest now. On this visit, he performed a magic show and played games with the children. Through the Tyler Foundation’s Shine On! Smile Ambassador Program, large groups of children are being supported in the Tohoku region. Guy travels through various parts of the Tohoku region on a regular basis visiting places such as shelters and offers performance which helps in psychological recovery. The foundation is accepting requests from schools and kindergartens who would like to receive a visit.